Officials are an important part of any sport. Without rules and people to enforce them games can quickly become unsafe and unfair for all involved. Roller derby officials come in two forms: the skating kind (SOs) and the non skating kind (NSOs). Simples. I'm going to tell you a bit about the SO side of roller derby officiating. 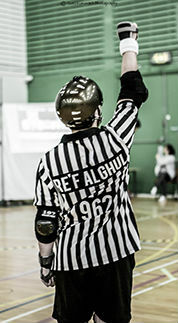 Firstly, the chance to officiate a roller derby game should be viewed as an honour. The skaters you will be officiating will have worked their derrières off to earn a place on that track and you as an official should approach your role with the same level of dedication. The roller derby community is very respectful of referees (not always whilst on track but the love is there, honest). It is important to bear in mind that although skaters couldn't play a game without us, we also could not do what we love without them! Being an official is great fun; you get to swot up on the rules, make lots of noise and spin about en-point in beautiful jammer-chasing ballet twirls whilst trying to count the blockers said jammer has passed! 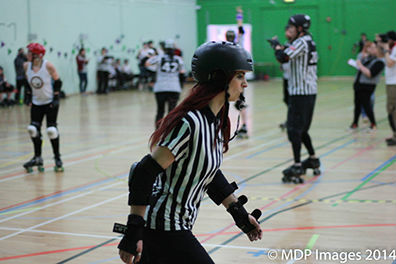 Roller derby referees are simply there to ensure the game is run as safely, fairly and consistently as possible. To ensure this happens each game has a maximum of 7 skating officials, all of which will be singing from the same hymn sheet/WFTDA rules book, code of conduct and standard practices document. Roller derby referees must also adhere to a uniform policy. As a result we make one fine looking herd of derbicus-equus when all lined up. Skates On : Bonts baby! If I'm wearing my stripes, I'm a happy girl, I just love reffing. Favourite skater: Jerry Attric, what an amazing blocker. "In Roller Derby, you should always be learning"